Cornbread is comfort food for me. Did your mom make cornbread? Mine did. Of course it wasn’t gluten free but this cornbread recipe, made with corn flour and cornmeal, tastes exactly like I remember my mom’s tasting. As kids we loved to eat our cornbread warm from the oven, covered in a thick layer of corn syrup, just like you see it in the photo. And now, many years later, that is exactly how my son likes to eat it. I have hundreds of great recipes, fantastic recipes, amazing to-die-for recipes. So many in fact, that I can’t even repeat them all in the course of one year. Many of those recipes I make just as they are written. Then I have a smaller collection of versatile recipes. These are recipes that can be made with some variation from season to season. This cornbread recipe is like that. It can be made sweet or savoury, as muffins, a loaf or even in my cast iron, molded corn-stick pan. I have even made it over the fire when camping (a very long time ago). This is also the recipe I use for my turkey stuffing. Now that’s what I call a versatile recipe. To perfect a recipe you likely need to make a few notes. Baking has a lot of variables plus every home cook measures ingredients a bit differently. The most basic rule of baking is to follow the recipe. If you are not entirely satisfied with the results of your baking pay more attention to some of the details. Then write down what you did. If you are on a gluten free diet or cook for someone who is gluten free there is no better reason than that to start learning. Gluten free baking has some new rules to learn but it is possible to bake fabulous gluten free food. You simply need to be willing to learn. I have a year-long blog post series on How To Use different gluten free flours including this one, How To Use Corn Flour, Cornmeal and Masa Harina. But all you really need to know to make excellent cornbread is that cornmeal and corn flour are not the same. 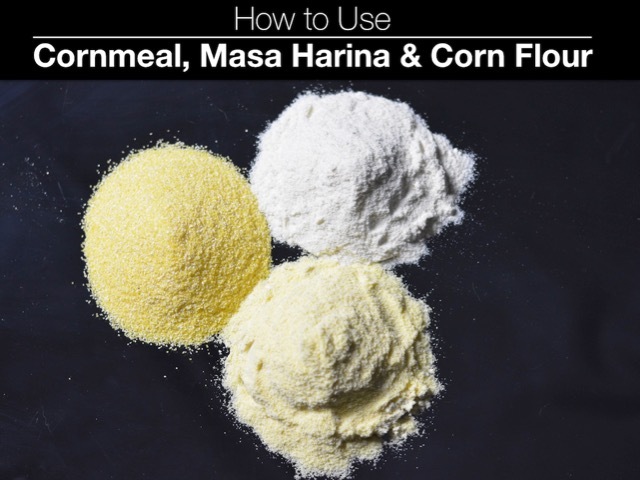 Cornmeal has a specific texture that some people love. Corn flour is further processed to a fine powder similar to other flours. Traditional cornbread recipes often call for a combination of cornmeal and wheat flour. Corn flour is an excellent substitute for the wheat flour. Although cornmeal and corn flour are both gluten free always read the label. Some brands are made in a facility with wheat so are not safe for those on a gluten free diet. Cornbread lends itself to everything from raspberries to bacon. Here are four of my favourite variations. RASPBERRY CORNMEAL MUFFINS – Add 1 cup fresh or frozen blueberries, 1 tablespoon of lemon zest and increase the sugar by 3 or 4 tablespoons. Portion the batter into a muffin tin and decrease the baking time slightly. Click this link to see my recipe. JALAPEÑO CHEDDAR CORNBREAD – Jalapeño jelly adds zip and sweetness to cornbread. Add 1 cup of grated cheddar cheese to the batter and pour half the batter into your pan. Drop blobs of jalapeño jelly all over, then top with the remaining batter and bake as usual. CHEDDAR CORN STICKS – Add 1 cup of shredded cheddar cheese to the cornbread batter. Bake in cast iron molded corn-stick pan for a less common but impressive presentation. Serve with homemade chili or a hearty soup. CORNBREAD CHORIZO STUFFING – For my turkey stuffing I double this cornbread recipe and then combine it with all the deliciousness of a sausage stuffing. It is then stuffed into an Achiote Butter Basted Turkey for Thanksgiving, Christmas or Christmas in July. And FYI – the ancho chile gravy, thickened with masa harina, is amazing. I’d love to hear about your favourite variation in the comments below. Preheat oven to 400°F. Lightly grease 8” x 8” cake pan, loaf pan or place paper liners in muffin tins. Combine wet ingredients in a mixing bowl and beat with electric mixer until frothy. Slowly add dry ingredients, mix until combined. Increase to high speed and mix for 1 minute. Stir in optional ingredients if using. Pour into prepared pan. Bake 20-25 minutes depending on the size of your pan. Cool 5 minutes before cutting. Serve warm.